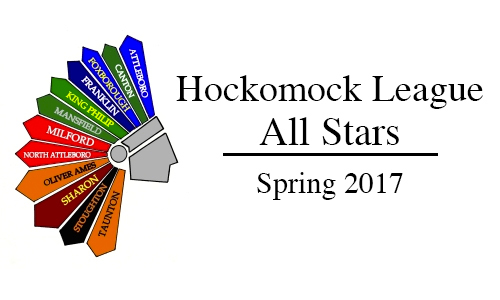 Below are the official 2017 Hockomock League Softball All Stars, selected by the coaches in the league. For a history of recent Hockomock League Softball All Stars, check out our history section. Canton, 4 vs. Cohasset, 3 – Final – After falling behind early, Canton rallied to tie the game in the fifth inning. In the sixth inning, senior Danny Hartnett doubled and senior Jackson Maffeo knocked in the go-ahead run with a single. Sophomore Paul Sullivan pitched three scoreless innings in relief to earn the win. King Philip, 0 @ Franklin, 6 – Final – Franklin’s offense got off to a strong start, plating five runs in the first inning and tacking on one more in the second to beat King Philip and qualify for the state tournament. Junior Bryan Woelfel tossed a complete game shutout with just three hits allowed, one walk and a pair of strikeouts. The Panthers loaded the bases with Jake Lyons (double), Ryan Hodgkins (hit by pitch) and Jason Ulrickson (bunt single) reaching base. Josh Macchi followed with an RBI single, Tyler Gomes knocked in a run with a sac fly and sophomore Alex Haba drove in two with a double. James Leofanti doubled to move Haba to third and Jake Macchi’s sacrifice fly brought Haba home. In the second inning, Ulrickson doubled to score Lyons. King Philip’s Dan Antunes tossed 4.2 scoreless innings of relief for the Warriors. Franklin, 8 @ Bridgewater-Raynham, 2 – Final – Franklin’s offense exploded for 14 hits as a team to complete a season sweep of the Trojans. Ally Shea had a three hits to lead the way while Tara Hartnett (RBI), Olivia DiGiacomo (two RBI, two runs), Anna Balkus (run) and Clara DeCarvalho (RBI double) each had a pair of hits. Alexx Niss also had a hit and brought in a run with a sacrifice fly. Milford, 5 @ St. Peter Marian, 2 – Final – Ali Atherton scattered six hits in a complete game effort, striking out four in the win. Offensively, Maggie Farrell stroked three hits, including two doubles, while also scoring a run. Jess Tomaso added two hits (double), knocked in two runs and scored once, Emily Piergustavo knocked in a run, scored a run and had one hit and Emily Hartman notched an RBI double. Sharon, 5 @ Ursuline, 4 – Final – Sharon’s Clara Cook struck out a season-high 15 batters to help the Eagles edge Ursuline on the road. Cook tossed a complete game to earn the win. Offensively, Sam Marglous went 2-for-4 with a pair of base hits and scored a run, and Alli Small, Rebecca Clayman, Shoshana Lowe and Sarah Levitt each had a single for Sharon. Franklin, 14 vs. Algonquin, 6 – Final – Franklin goalie Connor O’Rourke made eight saves the FHS head coach Lou Verrochi praised the defensive effort of his team’s defense as the Panthers picked up a key non-league win. Based on North Attleboro’s win over King Philip, the Panthers clinched at least a share of the Kelley-Rex division title. Eric Civetti had his way on the offensive end, netting eight goals with one assist and Sam Arsenault and Nitin Chaudhury each scored once and had two assists. Packie Watson found the back of the net twice and Kyle McEniry had two helpers; Johnny O’Glishen and Pat Morrison each tallied a goal as well. King Philip, 3 @ North Attleboro, 10 – Final – Click here for a recap of this game. Attleboro, 3 @ Franklin, 1 – Final – Attleboro senior Tyler McGovern tossed a complete game, scattering six hits while issuing just one walk to guide the Bombardiers past Franklin. James Weir went 2-for-4 with a run scored and two RBI and made a game-ending diving catch in the outfield for Big Blue. Dylan Maskell brought home the third run on a squeeze play. Franklin’s Jake Noviello also threw a complete game, allowing just two earned runs while striking out six. Ryan Hodgkins went 2-for-2 with a run and two stolen bases while Jason Ulrickson also notched two hits. King Philip, 0 @ Mansfield, 9 – Final – Mansfield senior Nolan Dousa needed just 70 pitches to finish a complete game shutout and the Hornets’ offense got off to a strong start early on to beat King Philip. Dousa tossed 54 of his 70 pitches for strikes, allowing just four hits and striking out for to earn the win. Mansfield scored five runs in the bottom of the first inning, added single runs in the third and fifth and then tacked on two more in the sixth. Zack Peterson (run, RBI) and Kyle Moran (two runs) each had a pair of hits for Mansfield. Aidan Cahill (1-for-3) and Cullen Anastasia (1-for-2, run) each knocked in a pair of runs for the Hornets. King Philip’s Ben Furfari had a pair of hits for the Warriors. North Attleboro, 7 @ Milford, 3 – Final – North Attleboro broke a 3-3 tie with a run in the fifth inning and then tacked on three more insurance runs in the seventh inning to pick up a key division win. Nick Sinacola picked up the win for Big Red, tossing a complete game with three strikeouts. At the plate, Sinacola went 2-for-3 with a pair of runs scored. John Brennan had a two-run single in the fourth inning that tied the game 3-3. Nick Crawley had a two-run hit in the seventh to tack on North’s final two runs. Milford’s Anthony Arcudi was 2-for-4 with two runs and an RBI and Aidan Wilde was 2-for-2 with an RBI. Taunton, 0 @ Oliver Ames, 3 – Final – Oliver Ames senior Sam Burr tossed a complete game shutout, allowing just four hits and didn’t issue a walk to help hand Taunton its first loss of the season. Burr struck out three in the win. Kyle Gagliardi was 2-for-3 and turned a double play in the third inning to help OA escape potential danger. Evan DeMartinis was also 2-for-3 while Nick Zwerle was 1-for-3 with two RBI. Stoughton, 13 @ Sharon, 0 – Final – Justin Hutchinson was dominant through the first four innings to earn the win and classmate Matt Gallagher completed the shutout with three innings of work with just two hits allowed. Hutchinson allowed just one hit in his four innings of work while striking out seven. Offensively, Ruben Gonzalez had a pair of hits, two runs scored, three stolen bases and four RBI to pace the Black Knights. Ryan Sullivan, Pat Hagerty, and Michael Batte each had two hits for Stoughton. Franklin, 1 @ Attleboro, 5 – Final – Attleboro’s McKenzie Bergdoll impressed in the circle and Jordyn Lako played a big role in the offense as the Bombardiers beat Franklin. Bergdoll allowed just two hits in a complete game effort to earn the win. Lako went 3-for-4 with two doubles and three RBI. Attleboro freshman Mishayla Cullhane took over at catcher in the first inning after an injury and head coach Mark Hoemr said “she did a great job for her first game behind the plate.” Homer added Attleboro’s solid play in the infield made a big difference for the Bombardiers. Mansfield, 3 @ King Philip, 9 – Final – King Philip scored five runs in the first to take control in the Kelley-Rex matchup. Jess Bonner had a standout day at the plate for the Warriors, hitting a pair of home runs and totaling five RBI. Jenn Hutnyan allowed just two hits in a strong game in the circle for KP. Meghan Gorman, Hailey McCasland and Elise Pereira each added a pair of hits in the Warriors’ win. Mady Bendanillo drove in all three Mansfield runs with a homer in the third inning, plating Sarah Bradley and Kara Bendanillo, and cut the lead to two. KP added four runs on five hits in the sixth to pull away. 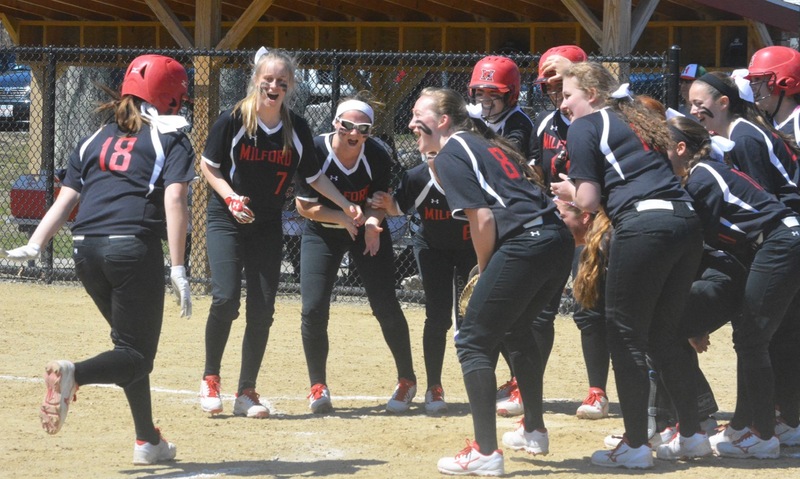 Milford, 14 @ North Attleboro, 3 – Final – Milford’s offense was locked in, belting out 17 hits to pick up a key division win over North Attleboro. Jess Tomaso accounted for four of those hits, including a double, and finished with two RBI and two runs scored. Kate Irwin (RBI, two runs, stolen base) and Emily Piergustavo (double, triple, three RBI, three runs) each had three hits for the Hawks. Emily Hartman connected on a solo home run and Shannon Cormier launched a three-run home run to complete Milford’s big day on offense. Ali Atherton scattered five hits in six innings of work, striking out six, allowing one walk and giving up just one earned run. Oliver Ames, 2 @ Taunton, 13 – Final – Taunton rebounded from a two-game losing streak to pick up the league win. Courtney Fisher threw four innings to get her sixth win and eighth grader Kelsey White threw three scoreless innings in relief, striking out six while allowing just one hit. Eighth grader Hannah Aldrich had three hits for Taunton, while Kya Enos had a homer, a double, and drove in three runs. Jaime Brown (RBI), MacKenzie Handrahan, Katie Van Zandt (RBI), McKenzie McAloon (RBI), and Jaylin Couto (two RBI) all had two hits apiece for Taunton. For Oliver Ames, Sarah Tetrault was 1-for-3 with a run scored, Kayla Georgeu was 1-for-2 with an RBI and a run scored. Colleen Larson was 1-for-2, putting Georgeu in scoring position for Victoria Ziner (1-3, RBI) to bunt Georgeu in for a run in the second. Sharon, 0 @ Stoughton, 9 – Final – Gina Carafa picked up the win in the circle, striking out seven Eagles in four innings, and also went 3-for-3 with five RBI, including a three-run homer in the first inning. Jordan Lyons went 2-for-3 and hit a two-run homer in the sixth for the Black Knights. Shannon Flaherty, Nikki Coppola, and Brianna Ferrandiz all had two hits apiece for Stoughton. Sam Marglous, Rebecca Clayman, and Courtney Sollis had hits for Sharon. Foxboro, 4 @ Canton, 2 – Final – Click here for a recap of the game. Franklin, 18 @ Sharon, 2 – Final – Franklin’s offense scored in double figures for the fifth time in the last six games, netting at least 18 for the fourth time in a big win at Sharon. Sam Arsenault (three goals, three assists) and Eric Civetti (five goals, one assist) each had six points to pace the offense. Nitin Chaudhury added two goals and one assists and Johnny O’Glishen and Jake Davis each found the back of the net twice. FHS coach Lou Verrochi praised Pat Morrison, Wyatt Arsenault and Spencer Briggs for their defensive work in front of goalie Connor O’Rourke (one goal allowed). Mansfield, 9 vs. Bridgewater-Raynham, 8 – Final – Bridgewater-Raynham staked a 5-4 lead at halftime but Mansfield ramped up its effort on both ends of the field to get the win. Senior Cullen Murphy (goal and assist) provided the game-winning goal off an assist from Aidan Sacco) Sean Powers had another strong game in goal, recording 16 saves while Grant Milas and Tommy Donnelly had strong games in front of him. Offensively, Hunter Ferreira netted a pair of goals and recorded two assists, Danny DeGirolamo and Sam O’Connell each scored twice, Joe Cox scored once and had two assists and Murphy and Sacco each scored once and had once assist for the Hornets. North Attleboro, 14 vs. Scituate, 6 – Final – North Attleboro picked up its biggest win of the season, knocking off Scituate at home. Big Red’s starters raced out to a 12-3 lead before the Sailors made a late push. Zach McGowan (one assist) and Jack Dakin (two assists) each scored four goals to pace the Rocketeers’ offense. Tommy Lindstrom set up three goals while LSM Max Fontes and Jason McNeany (14 face off wins) both scored twice. Nick Moore added one goal and one assist, Colin Young had one helper and Andy DeMattio scored once. Senior Dan MacDonald turned away 16 saves while also recording two assists for North Attleboro. Franklin, 4 @ Notre Dame Academy, 14 – Final – Franklin cut the deficit to just three goals early in the second half but the top-ranked team in the state pulled away with a 7-1 run. Kendall Reardon had two goals while Caroline Lounsbury and Erin Walsh each found the back of the net once. Freshman Gianna Cameron made 10 saves in net. Milford, 14 @ Taunton, 18 – Final – Eighth grader Alana Tavares scored 13 goals to lead the way for the Tigers. Abbey Kingman and Delaney Powell each scored two goals and Lorna Li made 13 saves in the win. Taylor Dube was the top scorer with five goals, Jill Burley added four goals, and Briana Maietta had a pair of goals, while Amber Stearns made eight saves in the loss. Oliver Ames, 17 @ Norton, 4 – Final – Oliver Ames snapped four game skid with an impressive performance on both ends on the road at Norton. Olivia Piazza poured in a team-high six goals to pace the offense while Kendall Clifford and Chloe Kikelly each had four goals. Sofia Masciarelli chipped in with two goals for the Tigers. Ari Waldorf made five saves in goal for OA. Franklin, 5 @ Attleboro, 0 – Final – Neither of Franklin’s doubles teams lost a game and the Panthers won all five games in straight sets to beat Attleboro. The team of James Johnston and Derek Wu won 6-0, 6-0 at first doubles and Tyler DiPalma and Rahul Hosdurg won 6-0, 6-0 at second doubles. In singles play, Rahul Herur won 6-3, 6-0 at first singles, Eli Brooks was victorious 6-1, 6-0 at second singles and freshman Rohan Herur notched a 6-0, 6-0 win at third singles. Mansfield, 2 @ King Philip, 3 – Final – King Philip picked up comfortable wins at first and third singles as well as second doubles to beat the Hornets. Cole Ginter won 6-2, 6-2 at first singles and Martin Matous won 6-0, 6-1 at third singles for KP. The team of Aidan Ignatius and Marco DiStefano won 6-1, 6-0 at second doubles to get the third and final point. Mansfield’s Luke Nickerson won 6-4, 6-1 at second singles. Milford, 1 @ North Attleboro, 4 – Final – North Attleboro won a pair of matches at singles as well as doubles to defend home court against the Scarlet Hawks. Senior Zac Pfeffer won 6-4, 6-0 at first singles and classmate Barsomo Nuay won 6-0, 6-0 at second singles. The team of senior Daniel Zhang and junior Ben Pfeffer won 6-1, 6-2 at first doubles and senior Andrew Harris and junior Mayank Wadekar won 6-2, 6-2 at second doubles. Milford senior Sam Little won 3-6, 7-6, 10-6 at third singles. Oliver Ames, 1 @ Taunton, 4 – Final – Taunton swept singles play and won three of its four matches in straight sets to take down Oliver Ames. Sophomore Brett Beaulieu won 6-0, 6-0 at first singles, junior Mike Briggs won 6-1, 6-0 at second singles and senior Eric Gwozdz won 7-6 (8-6), 6-4 at third singles. The team of sophomores Dylan Kullas and Charlie Fiske was 6-3, 6-4 at first doubles. Oliver Ames’ Greg Mueller and Michael Souza won 7-6, 7-5 at second doubles. Sharon, 5 @ Stoughton, 0 – Final – Sharon didn’t drop a game in any of its three singles matches on the road at Stoughton. Senior Griffin Fein and juniors Fred Bondar and Andre Olivei each won 6-0, 6-0 at first, second and third singles, respectively. Alex Romantz and Danujan Thirumavalavan won 6-0, 6-1 at first doubles and Alberto Olivei and Ashwin Sreevatsa won 6-0, 6-1 at second doubles. Attleboro, 0 @ Franklin, 5 – Final – Franklin won all five matches, three of them in straight sets to beat the Bombardiers. Senior Hannah Sweeney won 6-0, 6-0 at first singles, senior Anja Deric won 6-3, 6-0 at second singles and junior Stephanie Schiavo won 3-6, 7-6, 10-6 at third singles. The team of seniors Julia Hogan and Madison Derby won 6-3, 4-6, 6-4 at first singles and senior Sarah Labo and junior Jillian McLaughlin won 6-1, 6-3 at second doubles. Canton, 1 @ Foxboro, 4 – Final – The Warriors of Foxboro won all three singles matches in straight sets to defend home court. Sophia Prinos won 6-1, 6-0 at first singles, Julia Muise won 6-1, 6-0 at second singles and Kayla Prag picked up a 6-0, 6-0 win at third singles. The team of Olivia Dantona and Kendall Milender notched a 6-1, 3-6,6-3 at first doubles. Canton’s Stelina Michaelidis and Sarah Hernandez won 6-2, 7-5 at second doubles. King Philip, 4 @ Mansfield, 1 – Final – Neither of King Philip’s doubles teams dropped a single game and the Warriors also won two single matches in straight sets to pick up a win on the road. Freshman Erin Regnier won 6-2, 6-2 at second singles and junior Meghan Sepich won 6-2, 6-3 at third singles. The team of seniors Megan Davenport and Carly Adams won 6-0, 6-0 at first singles and the senior Corinne Palumbo and junior Lucy Barnard won by the same score at second doubles. Mansfield’s Paulina Martin won the first set 6-1 and then battled back from an 0-3 hole to win the second set 6-4 at first singles. Taunton, 5 @ Oliver Ames, 0 – Final – Taunton won all five matches in straight sets, dropping a total of four games in singles play and just one in doubles play. Olivia Sweeney won 6-1, 6-1 at first singles, Jordan Pagliuca notched a 6-0, 6-1 at second singles and Jillian Pagliuca recorded a 6-0, 6-1 win at third singles. The team of Ashleigh Eason and Emily Moor didn’t drop a single game in a 6-0, 6-0 win at first doubles and Jordan Martin and Caroline Hebert won 6-0, 6-1 at second doubles. Taunton, 3 @ Milford, 0 – Final – Taunton earned its second sweep of Milford this season, notching a 25-21, 25-22, 25-23 win. Taunton head coach Toby Chaperon said sophomore Gabe Kingman had a strong game in the back row for the Tigers while Malik Charles had seven kills and three blocks. Milford senior Jack Winship notched 10 kills, nine digs and four aces while classmate Danny Zwonik had 27 assists and an ace. Sophomore Joao Boaventura added eight kills, six digs and two blocks and sophomore Zach Brown had four kills, three blocks and an ace. Attleboro, 0 @ Mansfield, 3 – Final – Junior Tyler Dalton dazzled on the mound, tossing a complete game shutout to lead the Hornets. Dalton allowed just two hits, didn’t issue a walk and struck out a season-high 11 batters. Mansfield scored single runs in the second, third and fifth innings, totaling seven hits as a team. Zach Peterson went 2-for-3 with an RBI and a run scored while Max Boen was 1-for-2 with a walk, RBI and a run scored. Attleboro’s Dylan Maskell also had a solid outing on the mound, throwing six innings with six strikeouts. Sharon, 5 @ Foxboro, 4 – Final (9 inn.) – Sharon’s offense was quiet for the first six innings but scored in the seventh, eighth and ninth innings, eventually prevailing with a one-run victory over Foxboro. Trailing 1-0, the Eagles put up three runs in the top of the seventh to go ahead. Foxboro tied the game in the bottom half to send the game to extra innings. Both Sharon and Foxboro scored a run apiece in the eighth before Sharon scored the final run of the game in the top of the ninth. In the seventh, Aiden Arnold’s leadoff single preceded singles from Ben Stamm (3-for-4, RBI, run) and Jason Hertz. Jake Marglous tied it up with an RBI single. Spencer Singer connected on a two-run double to put the Eagles up 3-1. Foxboro got two back but Hertz threw the would-be winning run out at home to send the game to extras. Stamm knocked in Ben Schwartz in the top of the eighth but Foxboro knotted the game in the bottom half. In the top of the ninth, Arnold drew a lead off walk, stole second and scored on base hit from Jake Teven. Arnold earned the win in relief, and closed the game with a 1-2-3 ninth inning. Sophomore Noah Kamens had a strong start on the mound, throwing six innings without allowing an earned run while striking out two. “All the kids contributed and the way they fought back in the seventh, eighth and finally the ninth shows incredible resiliency from this group,” said Sharon head coach Kee Arguimbau. Franklin, 1 @ Milford, 5 – Final – Milford scored in five different innings to pick up its second straight win. The Scarlet Hawks scored single runs in the first, second, fourth, fifth and sixth against the Panthers. Aidan Wilde tossed a complete game without giving up an earned run, striking out seven and letting up just two hits. Ryan Goncalves went 2-for-4 with an RBI, a run scored and two stolen bases, Alex Coady had a home run and Anthony Arcudi was 1-for-3 with a double, a run and two stolen bases. North Attleboro, 7 @ Oliver Ames, 1 – Final – North Attleboro’s offense got off to a strong start for the second straight game, scoring a pair of runs in each of the first and second innings, adding two more in the fourth and one more in the sixth inning. Senior Matt Iaconis didn’t allow an earned run in six innings of work, scattering six hits, walking just one batter and striking out three to earn the win. Junior Peter Cohen pitched a scoreless seventh inning for the Rocketeers. Junior Nick Sinacola recorded four hits for Big Red, knocking in a pair of runs, Kyle McCarthy had two hits and two RBI and Iaconis also added a pair of hits. OA’s Chris Pearsons had a strong showing in relief, tossing five innings without surrendering an earned run. Taunton, 7 vs. Durfee, 6 – Final – Taunton rallied for two runs in the bottom of the seventh inning to earn a walk-off win over non-league rival Durfee. The Tigers took a 5-0 lead in the bottom of the first inning but Durfee scored four in the top of the second and took the lead with two runs in the fourth. Billy Emerson tied the game in the seventh with a pinch hit single and Chris Gomes knocked in the game-winner with a single. In the first inning, Jacob Crawford (3-for-4) and Matt Machado scored on a double from Christian Simoes. Gomes also had a two-run double in the first inning. Senior Danny Keogh earned the win, tossing three scoreless innings in relief. Sharon, 2 @ Foxboro, 1 – Final (8 inn.) – Sharon used extra innings to pick up its first win of the season. Senior catcher Sam Marglous (3-for-5) singled in the top of the eighth to drive in the game-winning run. Clara Cook went the distance to pick up the win, striking out eight and allowing only four hits. Sophomore Alli Small had two hits and scored the opening run in the third inning on a single by classmate Rebecca Clayman. Lexi Buckner tied the game for Foxboro with a solo homer in the sixth and it stayed tied into the eighth. 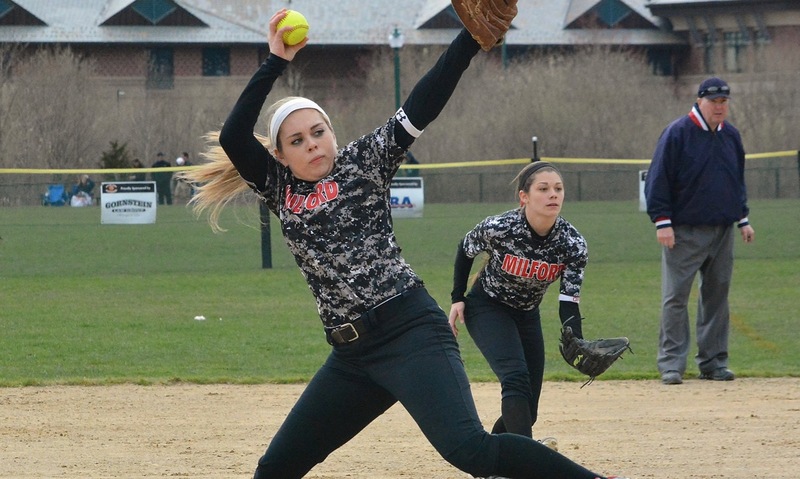 Milford, 6 @ Franklin, 1 – Final – Milford senior Ali Atherton inherited a two-on, no out situation in a relief appearance and struck out three straight batters to help the Hawks escape danger in the sixth inning. Atherton picked up the save with two innings of work. Kelley Reichert earned the win, striking out five while allowing five hits in five innings of work. At the plate, Maggie Farrell was 2-for-4 with two doubles and Emily Hartman was 3-for-4 with a double and an RBI. Milford head coach Steve DeVitto praised the defense play of shortstop Emily Piergustavo and third baseman Kaitlyn DeCapua. Oliver Ames, 1 @ North Attleboro, 13 – Final (6 inn.) – North Attleboro’s offense has been clicking lately, scoring 46 runs over the past three games. Bella Erti, who threw a perfect game earlier this week, allowed only one hit and an unearned run, while striking out five. Meg Barlow went 4-for-4 with three RBI for North and Liz Morehouse and Erti both had a pair of hits in the win. For Oliver Ames, Victoria Ziner was 1-for-3 with a run scored and was knocked in by Caroline Mahoney (RBI). Stoughton, 2 @ Canton, 14 – Final – Canton baptized its brand new turf with a big win over neighboring Stoughton. The Bulldogs raced out to a 8-1 lead at halftime with a big second quarter and capped its second half scoring with six goals in the third. Joey Vaughan scored the first goal on the new turf as Canton finished with ten different scorers. Sophomore Mike Shaw led with way with four goals and three assists while sophomore midfielder Matt Martin netted his first career goal. North Attleboro, 11 @ Plymouth North, 5 – Final – For the second straight game, the Rocketeers dominated the second half and came away with a win on the road. North was up 4-3 at half but allowed just two goals in the second half and scored seven goals to beat Plymouth North. Junior Jason McNeany had a dominant day at the face off X, winning 10 of 14 draws while adding two goals and one assist. Tommy Lockavitch also stepped up with a big game defensively, recording four ground balls. Zach McGowan (three goals, four assists) had seven points to pace the offense while Tommy Lindstrom chipped in with two goals and one assist and Colin Young had a pair of helpers. Paul Yeomans added a goal and an assist, Nick Ward, Owen Costello and Nick Moore each had a goal and David James had an assist. Franklin, 9 @ Bishop Feehan, 5 – Final – Franklin clamped down defensively, allowing just one goal in the second half to pull away from the Shamrocks. Franklin built a 6-4 lead by the break but won the second half 3-1. Annie Walsh had four goals, Erin Walsh had two goals and Jordan Jette recorded three assists to pace the offense. Freshman Gianna Cameron had five saves in net for the Panthers. Sharon, 18 @ Taunton, 12 – Final – Sharon had eight players score at least one goal, led by Alex Rabb with five and Christina Linehan added four. Sabrina Robbins added a hat trick for the Eagles and Anna Crosby had a pair of goals. Eighth grader Alana Tavares had four goals for the Tigers, while Abbey Kingman and Delaney Powell each had hat tricks. Attleboro, 2 @ Stoughton, 3 – Final – Stoughton avenged a loss to the Bombariders from a week ago, claiming a 3-2 decision in a non-league contest. Stoughton senior Stephens Bontemps won 6-3, 3-6, 6-4 at first singles, sophomore Erik Anderson won 6-2, 6-4 at second singles and the team of seniors Jon Podesta and Conor Kavanaugh won 6-3, 6-1 at first doubles. Attleboro’s Eli Araujo won 7-5, 6-4 at third singles and Ronaldo Salgueso and Hans Estrada won 6-1, 0-6, 10-7 at second doubles. Foxboro, 0 @ Sharon, 5 – Final – Sharon senior Griffin Fein had his back against the wall, down to his last point trailing 9-3 in a 10 point tiebreaker. But the defending Hockomock League MVP rattled off eight straight points to win 5-7, 6-3, 11-9 at first singles. Sharon’s Fred Bondar won 6-1, 6-2 at second singles and Danujan Thirumavalavan won 6-4, 6-4 at third singles. The team of senior Alex Romantz and freshman Alberto Olivei won 6-2, 6-1 at first doubles and senior Sammy Kirshenbaum and junior Ashwin Sreevatsa won 6-2, 6-0 at second doubles for the Eagles. King Philip, 2 vs. Bishop Feehan, 3 – Final – The Warriors were edged out by the Shamrocks in a close match, dropping a close first singles match and then losing in a tiebreaker in doubles play. KP’s Blake Ginter won 6-7 (7-4), 6-3, 10-6 at second singles and Martin Martous won 6-1, 6-2 at third singles. Sharon, 4 @ Foxboro, 1 – Final – Sharon picked up a key division win, winning at second and third singles and both double matches. Freshman Emily Zhang won 6-2, 7-6 (7-1) and junior Lulu Yuan won 6-0, 6-0 at third singles. Sharon’s Emily Wen and Sydney Gordon won 6-3, 6-2 at first doubles and Rithika Neti and Sophia Fein won 6-1, 6-2 at second doubles. Foxboro’s Sophia Prinos won a marathon match at first singles, prevailing 6-7 (7-9), 6-0, 7-6 (7-4). Milford, 0 @ Taunton, 3 – Final – Taunton bounced back from its first loss of the season with a sweep of Milford, pulling off a 25-20, 25-19, 28-26 victory. Nate Grant recorded 35 assists and had one kill to set up the offense. Lens Esquil had 13 kills, two aces and three blocks, David Fusiecki added seven kills, three aces and a block and Malik Charles notched seven kills and two blocks for the Tigers. Attleboro, 13 @ Dartmouth, 7 – Final – Sophomore Dakota Kirby knocked in a team-high four runs on three hits to lead the Bombardiers. Nate Tellier went 2-3 with a pair of RBI, pair of runs and pair of stolen bases while Robbie Araujo went 3-5 with an RBI. Canton, 7 vs. Cohasset, 0 – Final – Canton senior Kevin Powers allowed just three hits in a complete game shutout effort, striking out six on 73 pitches for the win. Jim Jenkins was a perfect 3-3 at the plate with a pair of singles and a double, Matt Casamento went 2-2 with a stolen base and two runs scored and Jimmy Hamrock scored a run. Franklin, 6 @ Foxboro, 2 – Final – Click here for a recap of this game. Sharon, 5 @ King Philip, 3 – Final – The Eagles scored three runs in the third and added two more in the fifth to build the lead. Sharon freshman left handed pitcher Noah Kamens made his varsity debut, tossing 5.2 innings for his first career win. Jordan Chabot went 2-4 with a double and a triple and knocked in three runs for Sharon. Stoughton, 1 @ Brockton, 0 – Final – Stoughton’s Justin Hutchinson tossed a one-hit complete game shutout, striking out five to lead the Black Knights to a win at Campanelli Stadium. Stoughton’s lone run came in the top of the second when Ryan Sullivan reached on a fielder’s choice. Joe Piana’s two out RBI single plated Sullivan for the lone run of the game. Franklin, 3 vs. Bridgewater-Raynham, 2 – Final – After Bridgewater-Raynham opened the scoring in the top of the first inning with a run, Franklin replied right away in the bottom half. Allie Shea led off with a single and Clara DeCarlvalho reached on an error. Alexx Niss then smashed a three run home run over the fence in centerfield. Caroline D’Aprile struck out five to get the win for Franklin. DeCarvalho also threw out two runners trying to steal with freshman Tara Hartnett applying the tags. Mansfield, 3 @ Milford, 8 – Final – Maggie Farrell launched a three run home run to center field in the fifth inning, turning a 3-1 deficit into a 4-3 lead and the Scarlet Hawks never looked back. Farrell went 2-4 with four RBI, also having a triple. Kate Irwin went 3-4 with a double, Jess Tomaso was 1-3 with a double, Megan Jacques went 1-2 with an RBI, a double and a walk and Emily Piergustavo went 2-3 with an RBI and three runs scored. Ali Atherton struck out a career-high 14 batters, allowing just one earned run. Mansfield’s Maddie Letendre struck out five while allowing 10 hits. Stoughton, 2 @ North Attleboro, 13 – Final – Click here for a recap of this game. Oliver Ames, 2 @ Weymouth, 3 – Final – OA’s Victoria Ziner was 2-3 with a double and a solo home run, Katie Pursley was 2-3 with a double, Jordyn Leite was 1-1 with a nice shot to center, and Dalene Gomes knocked in Sarah Tetrault on a suicide squeeze in the 7th. Kayla Georgeu pitched six innings for the Tigers striking out 5 and allowing only one earned run. Sharon, 2 vs. Milton, 10 – Final – Senior catcher Rachel Usen went 3-for-4 (a double and two singles) with an RBI for the Eagles in the loss. Freshman Jody Goldenberg had an RBI double and sophomore Sam Marglous added a double and a run scored for Sharon. Taunton, 24 @ Durfee, 0 – Final (5 inn.) – Jordan Wade hit a pair of home runs, knocking in four runs to lead Taunton’s offensive outburst. Courtney Fisher improved to 6-0 in the circle, allowing just one hit and striking out seven. Amber Wainwright had three hits, including a triple and two RBI, Bailey Clapp had three hits and two RBI, Sarah Bagge reached base five times, with two hits and five RBI and Aimee Kistner had two hits and an RBI. King Philip, 5 @ Milford, 0 – Final – King Philip put on a dominant performance on the road. Cole Ginter won 6-0, 6-2 at first singles, Garrett Schneider won 6-2, 6-0 at second singles and Blake Ginter won 6-0, 6-1 at third singles. Ryan Colella and Ryan Gemelli won 6-1, 6-2 at first doubles and Justin Rohan and Marco DiStefano won 6-0, 6-1 at second doubles. Milford, 1 @ Taunton, 3 – Final – The teams split the first two games but Taunton followed up with two straight wins to get the victory with a 25-17, 23-25, 25-15, 25-19 decision. David Perry stepped up on senior night for Taunton with 12 kills and 14 digs. Lance law added 18 kills, an ace and 14 digs and Lens Esquil had 12 kills and a block. Canton reached the postseason two seasons ago, despite only recording four wins, and this year’s crop of Bulldogs will be hoping to replicate that experience by getting the program back to the postseason. With senior lefty Sarah Reissfelder back in the circle, Canton has an experienced pitcher to rely on this spring and a power bat in the middle of the order. Senior captains Gabby Matthews, Colleen Phelan, and Kaitlin McCarthy will also provide some pop, while sophomore Hannah Jerrier is hoping to carry over her success from the basketball court to the softball diamond. Taylor Carrington (third base) and Lillian Carrington (centerfield) will also be players to watch as the Bulldogs fight for a spot in the Div. 2 tournament under head coach Tracy Andrews. Despite being below .500 again last season, Foxboro continued to improve its win total from the year before, going from six to seven to nine over the past three years, and clinching its fourth straight trip to the state tournament. Head coach Mark Maguire expects that a fifth trip will be in the cards for the Warriors again this spring but he is also setting his sights on challenging Oliver Ames and Milford at the top of the league standings. Senior Jenna Weinstein is back in the circle for the Warriors and will be the primary starting pitcher, but Foxboro also has depth at pitching and that can make a big difference over the course of the season. Freshmen Camyrn Willis and Emma Rohan will be developed as pitchers of the future. Weinstein will also be one of the Warriors’ top bats this season along with sophomore Hannah Davis, who is moving behind the plate to replace league all-star Bri Stern after a season at shortstop. Mary Lou Long will take over at short and Kelly Fisher will be at first base and batting cleanup, while senior Carolynn Will continues in center and has been a three-sport captain (soccer and basketball). Milford enters the season with the potential to win a fourth straight league title and challenging the top teams in the Div. 1 South. Senior shortstop Jill Powers and catcher Meg Jacques will provide leadership for an experienced and still young roster that features sophomore infielder Emily Piergustavo, who is already getting Div. I college interest. In the circle, junior Ali Atherton returns for a third year and she showed last year that she can compete with the best, as evidenced by her regular season win over South champ Silver Lake. Junior Maggie Farrell will add a lot of pop to the lineup and sophomore Jess Tomasso has transferred in from Hopedale and could make an instant impact in the middle of the order. Sophomore Kate Irwin will step in to fill an outfield role and freshman Emily Hartman will be used at multiple positions this year. Oliver Ames finished behind Milford in the Davenport last year, but pulled an upset over league rival Mansfield to advance to the first round of the state tournament to face eventual South champ Silver Lake. The Tigers will be hoping to challenge the Hawks again this spring and make a run at the league title. Spearheading the offensive attack for OA will be senior Jamie Gottwald, who led the Tigers with a .449 battling average and three homers last year. Classmate Katie Pursley will also be back after hitting .389 last year and fellow senior Missy Krim will bring experience to the outfield. Caroline Mahoney hit .352 last season and the sophomore return at third base, while junior Victoria Ziner has been off to a strong start at shortstop this preseason. Sharon will look to build on last season and while the Eagles may not be challenging for the league title this season they will be hoping that the mix of experienced starters and talented underclassmen can make a push towards the postseason. Sharon will be aided by experienced pitching, as junior Clara Cook will be the starter for the third season in a row and her battery-mate is senior Rachel Ulsen, a two-time Hockomock all-star. Senior Jenna Kranseler will be back at first base and junior Sam Marglous will be at shortstop. Head coach Deb Parker will also be counting on versatile freshmen Allison Small and Rebecca Clayman. After many years in charge of Stoughton softball, Janet Sullivan has stepped down and first-year head coach Tim Norton has taken over. Norton inherits a team that has lost nine seniors from last year and has as many as eight starters playing new positions this season. Sam Tullis will be behind the plate this year and the Black Knights will also return seniors Courtney Campbell, Nicole Bodette and Shannon Flaherty. Freshman Karly Estramera will be a player to watch, according to Norton, and may be the starting centerfielder.